KATHMANDU, May 26: Kathmandu Metropolitan City (KMC) has cleared up shops running in and around Dharahara premises. 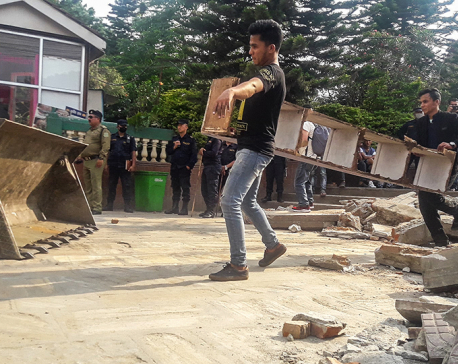 A team of police of KMC and Nepal Police on Saturday removed the shops which were running since long back at the place. 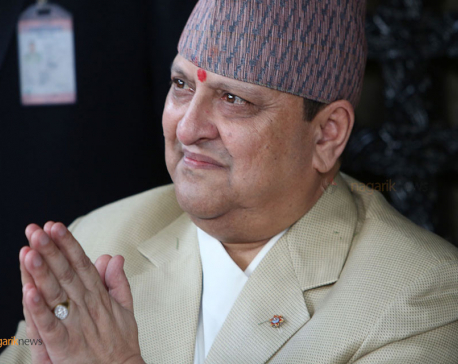 According to a letter summoned by the KMC to the local vendors running the shops over the site, it has been mentioned that the contract with them had already been terminated following destruction of Dharahara due to the massive earthquake on April 25, 2015 and had asked the local shopkeepers to vacant the area within 24 hours. However, the shopkeepers did not clear-off the place following which the KMC took action against them. The KMC used dozers to demolish infrastructures of the shops and restaurants around the site. The restaurants used to see the good flow of customers, especially youths, during the lunch and evening time.